60/65 Kim Hollis Dark (literally - you can't see what's happening), dull and confusing. Based on a novel by former Secret Service agent Gerald Petievich, The Sentinel stars Michael Douglas as Special Agent Pete Garrison, a man who is assigned to protect the president and has become convinced that a Neo-Nazi Aryan Disciple has somehow managed to position himself inside the White House. 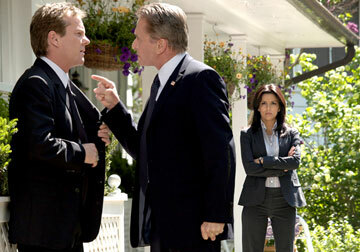 His efforts to investigate become complicated, however, when a White House agent is murdered. Garrison is framed for the crime and also finds himself the victim of a blackmailer who somehow knows about his affair with First Lady Sarah Ballentine (Kim Basinger). Officially relieved of his duties, Garrison nonetheless works to try to prove his own innocence, and also is determined to save the president's life. As he tries to uncover the mystery behind it all, he soon comes into confrontation with his protégé, Agent Breckinridge (Kiefer Sutherland). See the latest developments for this project on the The Sentinel Movie News page.